Georg Philipp Friedrich Freiherr von Hardenberg, commonly known as Novalis (May 2, 1772 – March 25, 1801), was one of the earliest of the German Romantics. Although Novalis' life would be tragically cut short, his poetic and philosophical works would go on to inspire many of the principal figures of Romanticism, among them Schiller, Goethe and Friedrich von Schlegel. In particular, Novalis is notable for contributing to the notion of "Romantic love" through his moving and lyrical love poetry, as well as for his far-reaching ambitions to unify the arts, sciences, and religion. Novalis' impassioned and ambitious temperament would make him a role-model for European artists of the nineteenth-century, and his considerable literary talents have cemented his reputation as one of the pre-eminent German poets of his times. 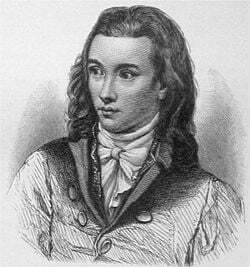 Novalis also contributed to the development of poetic form, in particular pioneering the use of poetic fragments as an art-form. His radical ideas and boundless enthusiasm left deep impressions on his friends, many of whom would go onto shape the literary tastes of nineteenth-century Germany. Novalis was born in 1772 on the château Oberwiederstedt located in the Harz Mountains near modern-day Saxony-Anhalt. Novalis descended from ancient, Low German nobility. In the different lines of his family, many important, influential magistrates and ministry officials can be found, including the Prussian chancellor Karl August von Hardenberg (1750-1822). In a church in Wiederstedt he was christened Georg Philipp Friedrich. Novalis spent his childhood on the family estate and used it as starting point for his travels into the Harz Mountains. Novalis’ father, Heinrich Ulrich Erasmus Freiherr (1738-1814), was devoted to Pietism, a German Christian sect somewhat analogous to the English Quakers. At first Novalis was taught by private tutors, including Christian Daniel Erhard Schmid (1762-1812), whom he met again at the beginning of his university education. Novalis attended the Luther grammar school in Eisleben, where he acquired training in rhetoric and ancient literature. Family troubles disrupted Novalis' childhood years, and from his twelfth year on, Novalis was cared for by his uncle Friedrich Wilhelm Freiherr von Hardenberg at the château Lucklum. Novalis studied law from 1790 to 1794 at the universities of Jena, Leipzig, and Wittenberg. He passed his exams with distinction. During his studies he attended Friedrich Schiller’s lecture courses on history. During a period where Schiller was convalescing from a bout of illness, Novalis visited often to continue conversations begun in the classroom, and the two men became friends. During this time Novalis also met Johann Wolfgang von Goethe and Johann Gottfried von Herder, and he became friends with Ludwig Tieck, Friedrich Wilhelm Joseph von Schelling and the brothers Friedrich and August Wilhelm Schlegel. In October 1794 Novalis did not become a civil servant—contrary to his plans—but instead worked as actuary for August Coelestin Just, who was not only his boss, but also his friend and later his biographer. During this time Novalis met the young Sophie von Kühn (1783-1797). On the March 15, 1795, he became engaged to her. The following January, Novalis was appointed auditor to the directorate of the saline in Weißenfels. The early and cruel death of his fiancée in March 1797 had a deep impact upon him. During this period he produced his earliest and most haunting volume of love poems, Hymnen an die Nacht (Hymns to the Night), published in 1800. In the hymns, Novalis laments the loss of Sophie as if were a mortal wound—he expresses his heartfelt belief that, without her, he will never be what he could have been; yet he also expresses hope that, with his own death, he will not only be reunited with her but with the whole world in a paradise of joy. Hymnen an die Nacht, in addition to setting a standard for what would become a long tradition of Romantic love poetry, also introduced a number of stylistic innovations that were to become characteristic of the radical era of Romanticism. Most notably, the volume included six prose poems, a form of poetry which at the time was still very new to European literature. Immediately after college, Novalis concerned himself with studying the scientific doctrine of Johann Gottlieb Fichte. Fichte would have a large impact on Novalis' worldview. He not only read Fichte’s philosophies, but also developed Fichte's concepts further. Novalis transformed Fichte’s Nicht-Ich ("not I") to a Du ("you"), an equal subject to the Ich ("I"). This was the starting point for his Liebesreligion ("religion of love"), in which Novalis argued that the "I" and "not I"—in other words, the Self and the Universe—form a bond precisely analogous to the bond between two lovers and that the ultimate state of the human soul was one of endless love for the world. After finishing his personal studies of Fichte, Novalis entered the Mining Academy of Freiberg in Saxony, a leading academy concerning science at the time, to study geology under Professor Abraham Gottlob Werner (1750-1817), who soon befriended him. During his studies in Freiberg. Novalis learned about mining, mathematics, chemistry and other subjects. He also received hands-on schooling in mines. In 1798 Novalis' first fragments were published in the Athenäum, a magazine edited by the brothers Friedrich and August Wilhelm Schlegel, who were also part of the movement of early Romanticism. This would be the first time Novalis would publish under his pseudonym, which he would retain for the rest of his life. In December 1798 Novalis became engaged for the second time. His fiancée was Julie von Charpentier (1788-1811), a daughter of Johann Friedrich Wilhelm Toussaint von Charpentier, a professor in Freiberg. On December 6, 1800, the 28-year-old Novalis was appointed as a provincial magistrate for the Thuringian District. Novalis had suffered from incurable tuberculosis since mid-1800, and he had to resign from his position as the Thuringian magistrate almost as soon as he had received it. On March 25, 1801, he died and was buried in Weißenfels. Novalis lived to see only the publication of the Blüthenstaub-Fragmente, Glaube und Liebe oder der König und die Königin, and Hymnen an die Nacht. His unfinished novels Heinrich von Ofterdingen and Die Lehrlinge zu Sais, as well as his political speech Europa were published posthumously by his friends Ludwig Tieck and Friedrich Schlegel. In August 1800, eight months after completion, the revised edition of the Hymnen an die Nacht was published in the Athenaeum. They are often considered to be the climax of Novalis’ lyrical works and the most important poetry of early German Romanticism. The six hymns contain many elements which can be understood as autobiographical. Even though a lyrical "I"—rather than Novalis himself—is the speaker, there are many relationships between the hymns and Hardenberg’s experiences from 1797-1800. The topic is the romantic interpretation of life and death, the threshold of which is symbolized by the night. Life and death are—according to Novalis—developed into intertwined concepts. So, in the end, death is the romantic principle of life. Novalis was clearly influenced by contemporary literature. The metaphors of the hymns are closely connected to the books Novalis had read at about the time the hymns were written. These are prominently Shakespeare’s Romeo and Juliet (in the translation by A. W. Schlegel, 1797) and Jean Paul’s Unsichtbare Loge (1793). The Hymnen an die Nacht display a universal religion with an intermediary. This concept is based on the idea that there is always a third party between a human and God. This intermediary can either be Jesus—as in Christian tradition—or the dead beloved, as in the hymns. These works consist of three sets of two hymns. These three sets can be structured according to the following principle: in each case the first hymn shows—with the help of the Romantic triad—the development from an assumed happy life on earth through a painful era of alienation to salvation in the eternal night. The following hymn tells of the awakening from this vision and the longing for a return to it. Continually the pairs of hymns increase and with each step show a higher level of experience and knowledge. The novel fragments Heinrich von Ofterdingen and Die Lehrlinge zu Sais clearly reflect the idea of describing a universal world harmony with the help of poetry. The novel Heinrich von Ofterdingen is the most notable of Novalis' prose works. It is set in an idyllic version of the European medieval ages, and focuses on the life of its eponymous hero Heinrich von Ofterdingen, a struggling poet. The novel, a traditional bildungsroman, describes Heinrich's development into a Romantic poet through a series of highly allegorical adventures. In particular, Heinrich experiences a series of continuous visions focusing on a blue flower. Following Novalis' death, "the blue flower" would become a universal symbol among the Romantics, symbolizing the ultimate, unattainable goal of all artistic strivings. Originally the novel was meant to be a response to Goethe’s Wilhelm Meister, a work that Novalis had read with enthusiasm but later judged to be highly unpoetical. In particular, Novalis disliked the fact that in Goethe's novel the practical and economic needs of the characters ultimately win out over their impractical, artistic yearnings. He wrote Heinrich on Ofterdingen primarily to support his point of view. Unlike most philosophers in history, Novalis did not develop a systematic exposition of his ideas, and consequently was not generally considered as a philosopher. This does not imply, however, that Novalis did not have notable philosophical insights. His ideas were buried and dispersed in fragmentary notes and sentences that took shape in poetic verses and mystical stories. Novalis held the idea that all knowledge culminates in philosophy and philosophy culminates in poetry. What distinguished Novalis from other literary writers was the awareness that while philosophy was limited in its ability to express truth, poetry has the unique ability and power to do so. Modern philosophy turned away from the ontological orientation of Medieval philosophy and focused on developing a theory of knowledge, that is, a study of cognitive capabilities of man as the subject of cognition. In the process of developing theories of the cognitive mechanism of the human subject, the self was presented in contrast to the world. The division or the separation of the man as the subject of cognition and the world as the object of cognition began with Rene Descartes and reached its peak with Immanuel Kant. Subsequent thinkers after Kant tried to develop an ontology which could explain man and the world as integral parts of reality. Fichte constructed idealist speculative metaphysics, which were succeeded by Schelling and culminated in Hegel. These German idealists posited an absolute spirit or absolute idea comparable to God as the reality of existence, and attempted to explain man and the world as the manifestation, or as parts, of this existence. Novalis, however, realized the limitation of language and conceptual theories in the form of philosophy. Since antiquity, philosophy has developed many abstract concepts and conceptual vocabularies such as subjectivity and objectivity, universal and particular, part and whole, and others. Thus, the perception of philosophers has been filtered through the lens of these conceptual tools that limit the way they can see the world. Novalis recognized the limitation of philosophy, or conceptual understanding in general, and recognized poetry and poetic novels as the forms that could more accurately imply and indicate genuine truth. Some philosophers who recognized the limitation of philosophy’s conceptual understanding paid considerable attention to poetry, including Martin Heidegger, who had studied Friedrich Holderlin. Zen Buddhism and other forms of Eastern thought were built upon the recognition of the limit of conceptual understanding and the limit of linguistic expression. They often use poetry to express the religious experiences that concepts and words cannot adequately describe and explain. Records indicated that Novalis widely studied mysticism, including the works of Boehm and Kabala, as well as Neoplatonism, and other works of modern science. Novalis identified heart as the field where all faculties of the mind, such as understanding, reasoning, imagination, and feelings, are integrated. Furthermore, he asserted that heart is not only the internal basis of human existence but also the internal aspect of all beings in the universe. Because heart was, for Novalis, an all encompassing field of all beings in the universe, poetic language rich in emotion could freely describe things in the world. Novalis presented stones, birds, flowers, and all other beings in nature in the way that human beings can feel with their heart using language indicative of love. Novalis was also convinced that each being in nature exists with its own creative power, and that the human being’s fundamental faculty is that of imaginative creativity. Thus, poetry is the result of the resonance of these two powers in man and nature. For Novalis, language—which is finite and relative—can indicate what it cannot explain and express, that is, the infinite and the absolute. In other words, language can imply that which is not expressible by being aware of the limitations of what language can explain. Thus, the visible and the invisible, expressible and inexpressible, finite and infinite, relative and absolute, conceptual and imaginary can all be presented in the form of poetic languages. Novalis’ awareness of the limitation of language is expressed by the imagery of ‘night’ in his work. While at night, visibility and the ability to make clear distinctions are limited, linguistic expressions have a similar “veiling” function. By placing the veil of words over the world, the world itself implies a meaning deeper than the text. Novalis’ awareness of the limitation of language is also indicated by his use of color. While Goethe used specific colors in order to describe figures and clothing, Novalis did not. Instead, Novalis used natural objects to describe color. Natural objects constantly change their color or appearance, and the vocabulary is misleading because it turns the changing quality of natural objects into an unchanging property. Similarly for objects that exist in dreams, Novalis tried to avoid attaching unchanging, stable definitions to images such as fish, trees, rocks, and others; he tried to express the fluidity of meaning and the playfulness of the world. Poetic descriptions were, for Novalis, the only form that reveals the mystical reality of the world, and at the same time that allowed the dynamic synthesis of all the faculties of man including imagination, thinking, feeling, willing, and loving. Novalis’ rejection of the conceptualization of his insights kept him in the realm of poetry, but his poetic intuition has been a source of inspiration for those philosophers who knew of the limitations of philosophy. Novalis' works were originally issued in two volumes by his friends Ludwig Tieck and Friedrich von Schlegel (2 vols., 1802; a third volume was added in 1846). Editions of Novalis' collected works have since been compiled by C. Meisner and Bruno Wille (1898), by E. Heilborn (3 vols., 1901), and by J. Minor (3 vols., 1907). Heinrich von Ofterdingen was published separately by J. Schmidt in 1876. Several of Novalis' philosophical works have been recently translated into English. Novalis: Philosophical Writings, trans. and ed. Margaret Mahoney Stoljar, State University of New York Press, 1997. This volume contains several of Novalis' works, including Pollen or Miscellaneous Observations, one of the few complete works published in his lifetime (though it was altered for publication by Friedrich Schlegel); Logological Fragments I and II; Monologue, a long fragment on language; Faith and Love or The King and Queen, a collection of political fragments also published during his lifetime; On Goethe; selections from his unfinished encyclopedia, Allgemeine Broullion or General Draft; and his essay Christendom or Europe. Classic and Romantic German Aesthetics, ed. Jay Bernstein, Cambridge University Press, 2003. This book is in the same series as Fichte Studies and contains a very good selection of fragments, plus it includes Novalis' Dialogues. Also in this collection are fragments by Schlegel and Hölderlin. This page was last modified on 13 December 2018, at 20:51.